In the light metal production industry, where operation is 24/7, there is a constant challenge to further improve the safe working environment. 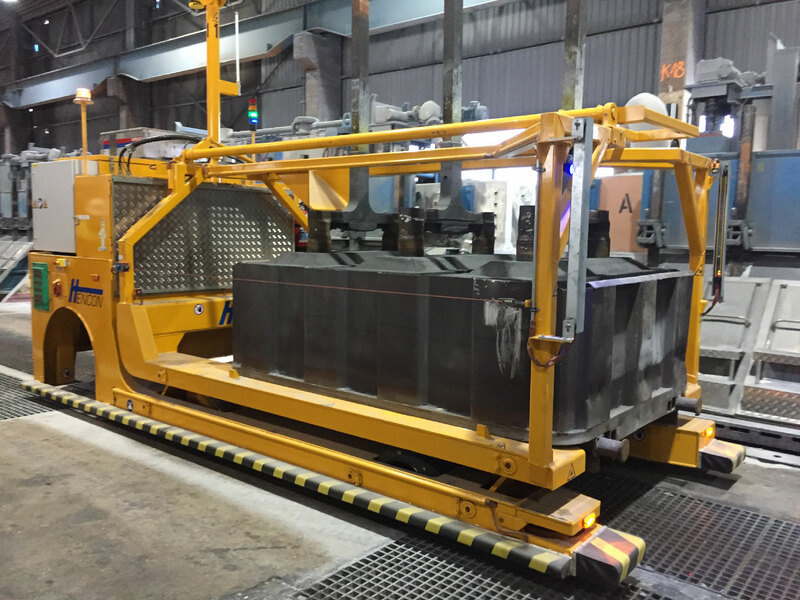 Hencon stepped up to this challenge by developing a solution for the transportation of anodes without operators. The first Automated Guided Vehicles (AGVs) are being delivered to the potroom of an aluminium production plant. Hencon engineers have developed a fully autonomous computer-controlled electric vehicle for this purpose. “We had to take into consideration lots of external factors, the magnetic field being the most challenging” pointed out Project Manager Rudi Roth of Hencon. “After an extensive test period we made the AGVs in such a way that the magnetic field will have no direct influence on the operation of the machine”. System creates the most efficient routing. The AGV will be directed to the specific locations indicated by the Manufacturing Execution System (MES). This guarantees that the AGV is always at the right place at the right time, ensuring maximum production efficiency. The AGV’s charging capability is one of its unique features. The AGV will charge at locations along the route. Unlike lead-acid batteries, there is no need for an additional charging room when using lithium-ion battery technology. The charges can be short and will take place whenever the machine has a few minutes to spare within the process. The Hencon AGV features a number of safety measures to help avoid any collision with people or objects. Several sensors ensure that the AGV reduces speed and stops in time in order to avoid any collision. All in all, Hencon sets improved safety standards for the transportation of anodes in a potroom environment. Commercial Director Elwin Roetman commented: “At Hencon, we’re constantly looking into ways to improve our customer’s productivity by supplying them with solutions that not only ensure a stable and safe production process but also benefit our customers by generating a sustainable profit.” With the development of AGVs, Hencon has taken the next step into mobile solutions for the light metal industry.